Bellringers from Dorchester and neighbouring towns and villages rang the bells of St Peter’s Church at 4.30pm on 11 January to mark the latest citizenship ceremony held at County Hall. 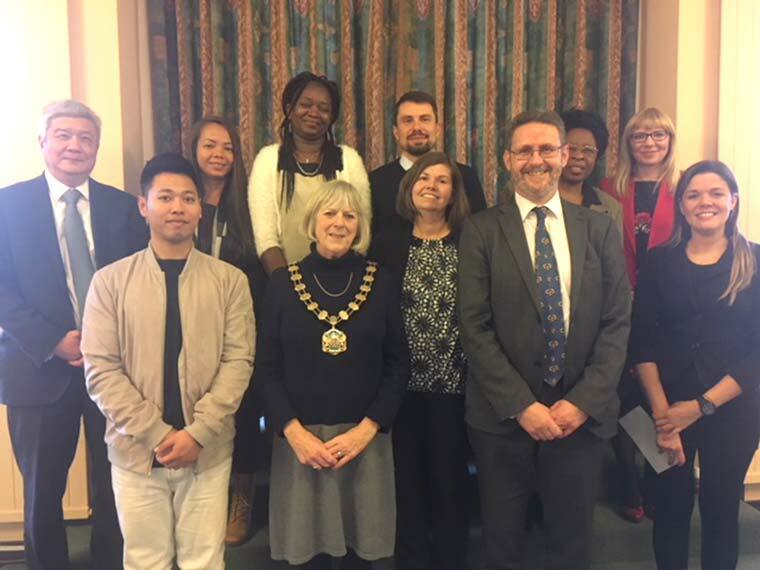 Dorset County Council chairman, Hilary Cox, officially welcomed nine new British citizens to Dorset and the occasion was marked with a peal of bells from St Peter’s Church, Dorchester. At a citizenship ceremony the new citizens are individually introduced and welcomed by a Dorset County Council registrar and representative – usually the chairman or the vice-chairman. The new citizens then swear or affirm an oath to the Queen, sing the national anthem, and are presented with their citizen certificate and a small framed picture of the local area, before signing the citizenship register. Leading the bellringing team of eight, Will Haydock, tower captain at St Peter’s Church, said, “There can’t be many things more British than the sound of bell ringing, so this seemed the perfect way to publicly welcome people into our local community. To “Bellringing,” he said, “is a great way to meet new people.” If you’re interested in taking up the activity in Dorchester, please contact Will Haydock on 01305 458205 or william.haydock@outlook.com. For more information about Ringing Remembers, see https://www.gov.uk/government/news/nations-bells-to-ring-out-together-to-mark-armistice-centenary.